Tilting the lens simulates a macro shot or a miniature scene. This one effect is easy to reproduce in the post. You don’t lose anything by doing the tilt-shift effect in post-processing, and you won’t gain anything by using a real tilt-shift lens to capture the same scene. In fact, by using a real tilt-shift lens, you lose much of the convenience provided by modern autofocus cameras, sacrificing the AF and automatic aperture control. Check out today’s tilt-shift lenses: they cost an arm and a leg, yet they’re all manual focus, and some of them still require you to set aperture manually and use stop-down metering, slowing down your shooting a great deal. The tilt-shift technique allows photographers tilting plane of focus, achieving selective focus effect and producing photos with characteristic ‘macro’ look. Pictures taken with a tilt-shift lens reproduce the look of a miniature scene shot up close, at a macro distance. The effect has been known since advent of boxy, wooden large format cameras. Using flexible bellows for camera movements, large format photographers could turn any lens into a tilt-shift lens, reproducing faux-diorama shots without an extra investment. Today’s photographers shooting 35mm film and all kinds of digital cameras can only achieve the effect by either using a dedicated, expensive tilt-shift lens or reproducing the effect in post-processing with photo editing software. With the most affordable tilt-shift lens produced by a major manufacturer costing more than $1200, tilt-shift photography remains an expensive hobby for most amateurs. Technological constraints and limitations of even the best tilt-shift lenses (manual focus, manual aperture, stop-down or manual metering, lack of zoom etc.) make using these lenses inconvenient even to dedicated professionals shooting anything but still architecture and landscapes. Post-processing images with image editing software gives photographers a feasible alternative at a small fraction of the price of a real tilt-shift lens, offering nearly indistinguishable results while providing photographers far greater convenience, control and flexibility. 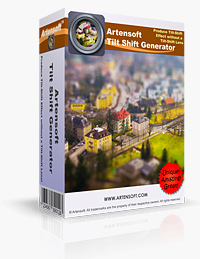 Tilt-Shift Generator offers enthusiast photographers an easy way of reproducing the ‘miniature‘ effect of a tilt-shift lens without actually owning one. The tool allows Windows users to emulate the selective focus effect by post-processing images taken with any camera, any lens at any setting. I use it for single person pics to blur the sides / background of the pic. This makes the person / face stand out nicely. Trim up with built-in brightness, contrast and saturation options. Does what it does really well – I took this as a freebie 14 months ago – it’s worth more than 60%+ and it joins my list of only 3 freebies I have (GoodSync Pro and Shadow Defender) taken that were worth paying for.